This tutorial will teach you how to cover a cake with fondant. Fondant-covered cakes have a smooth, professional look that's easy to achieve at home with a little practice and patience. Begin by gathering your ingredients. To cover a standard standard-sized 9 or 10-inch cake with fondant, you will need approximately 2 pounds of fondant. You can use purchased fondant (be sure you get "rolled" fondant as opposed to "pouring" fondant), or you can make your own marshmallow fondant or rolled fondant. In addition to the fondant, you will need a cake that is covered with a layer of buttercream at least 1/4-inch thick. 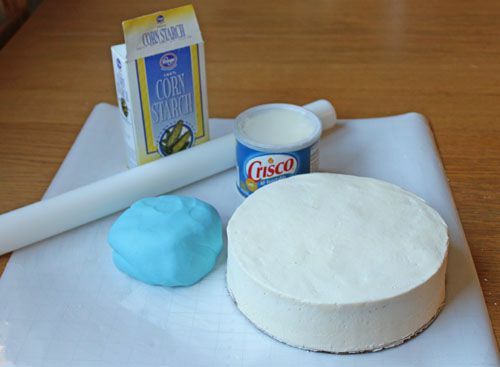 This frosting layer helps the fondant stick to the cake and smooths out any bumps or imperfections on the cake surface, so the fondant layer looks clean and smooth. You will also need cornstarch, vegetable shortening, a rolling pin (preferably nonstick) and a large, smooth workstation. Dust your work station lightly with cornstarch, and begin by kneading the fondant like bread dough until it is smooth and pliable. Fondant, especially if it has been sitting unused for a while, tends to get stiff and crumbly, so you must knead it until it is soft and supple. If, after a lot of kneading, it still feels very dry, you can knead in a small spoonful of vegetable shortening to soften it up. By the end of your kneading, you shouldn’t have any cracks along the edges of the fondant ball. Now it’s time to roll the fondant out. If you have a large nonstick mat or cutting board without a texture, those are good options. Otherwise, use a surface that’s large enough, and that won’t mar the fondant with too much texture. If you have a nonstick rolling pin, use that as well. Making sure your workstation still has a light dusting of cornstarch, begin to roll the fondant out in the approximate shape of your cake: a circle for a round cake, a rectangle for a rectangular cake, etc. Occasionally lift the fondant and rotate it 45 degrees. This ensures it’s not sticking to the mat, and it also helps to roll more evenly. Roll the fondant until it is the size you need. For a round 9-inch cake that’s 3 inches high, you’ll need your circle to be at least 15 inches around (two 3-inch sides plus 9 inches across), but you should aim for an inch or two of flexibility on each side. So for your 9-inch cake, the optimal size will be a fondant circle about 17 inches across. 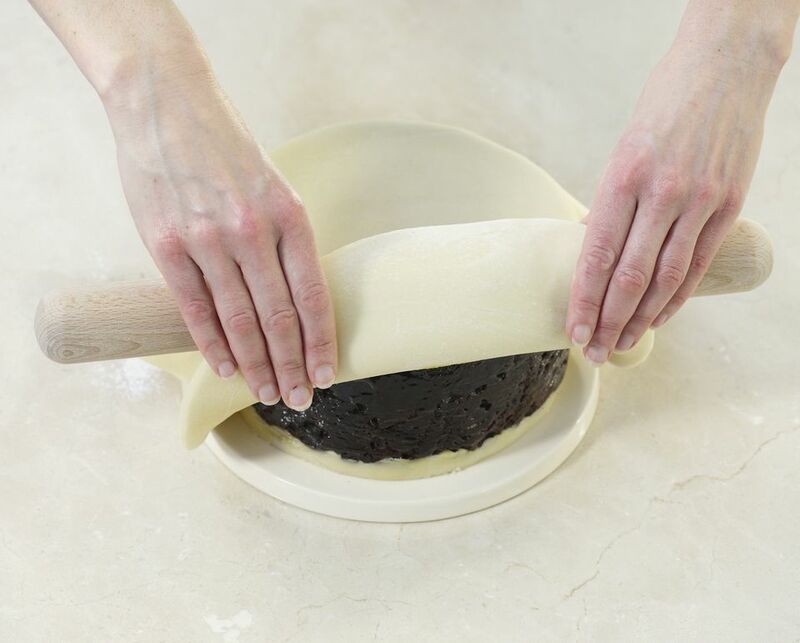 Once you finish rolling, your fondant will ideally have a thickness of about 1/8 inch. A little thicker is okay, but don’t go thinner than that. Otherwise, the fondant is too easy to tear or rip. Once your fondant is the right shape and thickness, place the rolling pin on the farthest edge of the fondant and roll it toward you, rolling the fondant up around the pin. Continue rolling until all of the fondant is gently rolled around the rolling pin. Quickly lift the rolling pin and place it next to the side of the cake. Start unrolling the fondant from the pin until it hangs just below the bottom edge of the cake. Continue unrolling the fondant across the top of the cake to the other side. When you finish, your cake should be draped in an even covering of fondant. Use your hand to carefully smooth the top of the cake and remove any air bubbles from under the fondant. Be sure that you don’t have any jewelry on that might leave marks, and avoid using your fingernails, as fondant is easily marred and scratches are very hard to repair. Now position your other hand on the side of the cake toward the top and press the fondant into the side. Use your hands together to press toward each other, forming the corner of the cake. It’s important to do this step quickly, as the weight of the fondant hanging from the top tends to form small cracks in the corners if the sides aren’t pressed in quickly. If you do develop small cracks, you can rub a little vegetable shortening into those spots which will help disguise them. At this point, you probably have a lot of excess fondant toward the bottom that will form ruffles and seams if you’re not careful. Start to gently stretch the fondant at the bottom of the cake out, gently holding the fondant with your hands and pulling them away from each other so that you are spreading the excess fondant. Slide one hand down the side and smooth the fondant in a downward motion; you will probably not want to go all the way to the bottom at this point. Turn the cake and repeat this process again and again. You may have to make several passes over the cake, very gently pulling the excess fondant out and down, and then using your hand to smooth the fondant onto the cake. This is the key to smooth sides, but it is a tricky motion and one that requires some practice. Be gentle when doing this step! Fondant cracks and tears easily, so it’s better to take several minutes and go over the cake several times than to pull the fondant too hard and create a rip you cannot repair. Once you have taken care of any excess fondant at the bottom, take one hand and firmly press the fondant into the sides of the cake, removing air bubbles and firmly sticking the fondant to the buttercream. Press down with the bottom of your hand to create a firm corner around the bottom of the cake. If you notice any air bubbles remaining, use a small sharp pin to prick a hole in the bubble and smooth it out. Use a sharp paring knife to trim the excess fondant from the bottom of the cake. Now your cake is now covered in fondant! At this point, it can be finished with additional fondant or buttercream decorations and borders. If possible, you should avoid refrigerating your cake, as fondant readily absorbs moisture, and is often sticky and wet when removed from a refrigerator. Optimally, you should store your cake in a cool location in a cake box, and eat it within a day or two.